Confusion causes worry: get the facts about your worries and solve the problem. How would you feel if someone told you on Sunday evening that, come Monday morning, you would be thrown into a torture chamber? Would you worry? Probably. But there would be a way to deal with those worries. Confusion is the chief cause of worry, said Herbert E. Hawkes, Dean of Columbia College. According to him, few people bother analyzing the facts of their situation when they are worried. 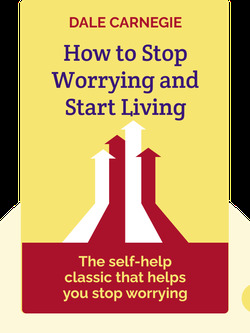 He proposed that all kinds of worries can be resolved by applying a simple three-step analysis. That is precisely what Galen Litchfield did in 1942 when, stuck in Japanese-occupied Shanghai, he got news that a Japanese admiral had found out about the assets he’d hidden from the Japanese. His punishment was to be thrown into the notorious torture chamber of the Japanese secret police on Monday. Litchfield heard the news on Sunday, and wondered what to do. First, get the facts about why you’re worried: Litchfield took a typewriter and wrote down what he was worried about – being tortured to death in the morning. Second, analyze those facts: Litchfield wrote “What can I do about it?” and underneath listed his various options, like fleeing, explaining himself or acting like nothing happened. Third, make a decision about what to do, and do it: Litchfield decided his only option was to go into work like nothing had happened. Apparently, the Japanese admiral had calmed down, for he merely scowled at Litchfield. As you can see, analyzing your worries carefully can even save your life sometimes. Once you’ve decided how to address your worries, take action and never look back. Live for today: keep the worries of yesterday and tomorrow out of your head. Whenever you’re facing trouble, embrace the worst-case scenario and then try to improve from there. Don’t sink energy into hopeless situations or grudges: set a limit for yourself after which you stop worrying about them. Be happier by focusing on the positives in life and acting happy. Don’t expect gratitude; give for the joy of giving. Don’t envy or imitate others; be yourself. People criticize those they envy; think of criticisms against you as disguised compliments. Learn to relax and rest before you get tired. Enjoy your work and negate stress by being organized. Start your free Blinkist trial to get unlimited access to key ideas from How to Stop Worrying and Start Living and over 3,000 other nonfiction titles. With bitesize text and audio, it's easier than ever to find the right ideas to transform your life.